Design & typography by Jerry Kelly. Set in Adobe Garamond Premier types. 16 pp. 6″x9″. Black and white; illustrated. 300 copies printed. Blue Pencil has not previously tackled monographs or articles, but there is no reason that they should fall outside of its ambit. This combination review and dissection of Type Revivals: What are they? Where did they come from? Where are they going? by Jerry Kelly is occasioned by my long-standing interest in the subject. Type revivals are at the heart of many debates about typography and design in general over the course of the last 120 years. They have tended to occur at times of technological upheaval, moments when printers, typographers and graphic designers have found themselves caught between the past and the future, debating the best way forward. One group, usually dubbed the traditionalists, argue that the best typefaces of the past need to be available for new technology in order to maintain historical and cultural continuity and to benefit from the skill and wisdom of earlier punchcutters and typefounders. In opposition, another group, usually described as modernists, declares that the types of the past are inextricably linked to the type-making and printing technologies of their time and thus are irrelevant once those technologies have been superseded. What is needed instead are types for our time. But time is fluid, making arguments over what constitutes a classic and what defines a type of “our” time very slippery. Two questions arise: 1. for the traditionalists: is there a cut-off point that defines the “classic” past? and 2. for the modernists: when does “our” time cease to be the present and become the past? • Which types should be revived? Do we revive those that were the most popular in the past or those that meet some undefinable yet eternal standard of quality? Do we revive a typeface because it meets a contemporary need? • What is the best source for those types? Do we base a revival on surviving punches and matrices, printed samples (whether from a book or a specimen sheet) or on original drawings? What do we do about metal typefaces that existed in multiple sizes? • What is the best method of making a revival? Do we photograph or scan sources for tracing by hand or via software? • How faithful should a revival be to the original type? How do we adapt to changes in technology? What do we do about filling in characters missing in the original, either due to deficiencies in the source material or changes in communication needs? Do we account for changes in taste? How do we justify our decisions? These questions are not easily answered. What constitutes a revival is the hardest one of all. There are many levels of “revivals” from facsimiles to technological conversions/adaptations to updates to “pure” revivals—sensitive or not—to interpretations. Some of these issues are tackled by Kelly in his essay, but many others are brushed aside or not even acknowledged at all. Type Revivals originated as a talk given by Kelly at the 2008 ATypI Congress in St. Petersburg. He reprised the talk—apparently unrevised—for CooperType in the spring of 2012. It has now been published as the latest monograph from The Typophiles (1). In it Kelly sets out to define what a revival is, outline the history of revivals and predict their future. The first task he accomplishes reasonably well, the second less so, and the third not at all. In looking for the first type revival Kelly jumps from Pickering and Whittingham in the 1830s and 1840s to William Morris sixty years later, ignoring along the way Alexander Phemister’s “old style” typefaces (4) cut for Miller & Richard c.1858 as versions of Caslon (minus its “objectionable peculiarities”) and hurriedly dismissing Basle Roman (William Howard, 1854), based on an early 16th century fount by Johannes Froben, and several other Victorian types that imitated “the rough types of the incunabula period”. The latter are derided as “facsimile types”, “novelty fonts” and “quirky deviants” (5) and dismissed as not worthy of being considered revivals because they were “not meant for wide use.” Why should the quality of their design or their intended use make a difference in whether or not these types qualify as revivals? (6) Certainly, William Morris’ Golden Type was not meant for wide use either and yet it is the design that Kelly anoints as the first true type revival. 2. Using photography and enlargements to help reveal the true character of the letterforms. 4. Adapting the design for current production and use. These are debatable points. What is meant by “the finest specimens of the design under consideration”? Those who have followed the debates over the quality of various type revivals during the past several decades know that one of the more contentious aspects of a revival is the nature and quality of the model it is based on. Is the model the best one aesthetically? (This is always a subjective issue.) Is the model the best one productionwise? That is, if it is a metal typeface, is it cleanly and crisply printed? Is it an appropriate size? Does it have a sufficient range of characters? Kelly only touches upon some of these questions and then briefly. He chastises Monotype for including an erroneous a in its cutting of Plantin (F.H. Pierpont, 1913) as a revival of a face by Robert Granjon and praises Matthew Carter for getting things right with ITC Galliard. But the two faces differ in many other respects than a lone letter (e.g. the tail of Q). And a discussion of these differences—and an acknowledgement that they are based on different Granjon founts—would be useful. Kelly conflates two of Carter’s key decisions: to base the roman on Granjon’s ascendonica size and the italic on Granjon’s pendante style. The fact that another Granjon italic is the basis for Adobe Garamond Italic goes unmentioned. The most complicated and, to many, confusing revivals are the many typefaces bearing the name Garamond. Kelly addresses this topic only glancingly, praising Granjon, Stempel Garamond, Sabon and Adobe Garamond as authentic and saying of ITC Garamond that, “…I believe that were Claude Garamond to come back to life today he would not recognize any aspect of his work in ITC’s ‘Garamond’.” He points out that most of the typefaces called Garamond—including ITC Garamond—are actually based on the work of Jean Jannon, who he defends against charges that he copied Garamond (7). The crucial issue of optical sizing is addressed by Kelly towards the end of his essay. He says that it an important aspect of selecting a proper model but he provides no examples. This is especially odd since he squared off with Mark Argetsinger over this issue as it pertained to the original version of Adobe Garamond in a double number of Printing History twenty years ago (8). Argetsinger criticized Adobe and Robert Slimbach for basing Adobe Garamond Pro on an ascendonica size of Claude Garamont’s types rather than on a smaller one; and Kelly defended the decision. With the release in 2006 of Adobe Garamond Premier Pro we learned that Adobe Garamond was a compromise between what Slimbach wanted to do in 1989 vis a vis a true Garamond revival and what Adobe needed in the way of a marketable font at that time. With Adobe Garamond Premier Pro, Slimbach finally achieved his goals: a Garamond with multiple optical sizes. Thus, the font is not an update of Adobe Garamond or of Adobe Garamond Pro but a completely different design. Given that Type Revivals is set in it, is astonishing that Kelly never discusses Adobe Garamond Premier Pro. To return to Kelly’s criteria for a true type revival, is it really necessary for photographic enlargements to be used as both William Morris and Bruce Rogers did for their Jenson interpretations? Can scans be used? What about eschewing such enlargements as Howes apparently did in making ITC Founders Caslon? Most of all, why should the methodology used in creating a type revival determine if it is a “true” revival or not? Kelly’s third point is clearly intended as a way of distinguishing between typefaces such as Adobe Jenson Pro and designs such as Zainer Regular (Shane Brandes, Proportional Lime, 2012)—“based on one of his [Gunther Zainer’s] more interesting and peculiar fonts”—that appear to be autotraced. But can it honestly be said that either Morris’ chunky Golden Type or Rogers’ elegant Centaur captured the essence of Nicholas Jenson’s roman type? The “essence” of a typeface is elusive and trying to capture it in a revival is a subjective achievement. This seems to be a criterion more suited to a debate about the “success” of a revival than a determinant of whether it is “true” or not. Is Kelly’s fourth point crucial in defining a typeface as a “true” revival? It is certainly true that Morison at Monotype, Matthew Carter at Mergenthaler Linotype, and Robert Slimbach at Adobe all had to contend with new technologies in making their revivals of Jenson, Griffo, Garamond, Granjon, Caslon et al. But what about Morris and Rogers? Both designed their versions of Jenson for the same technology that Jenson used, the iron handpress. The real issue, going back to Kelly’s third point, is how well a revival manages to retain the spirit of its model despite being adapted to fit a newer technology and newer circumstances (e.g. larger character sets). It is here that types such as Bembo, Sabon and Renard (the latter two ignored by Kelly) earn their accolades. “The 75 years between 1915 and 1990 were a golden age of type revivals.” Kelly declares. These are odd dates, chosen it seems as a way of squeezing in Centaur (1915 in Kelly’s telling but more properly 1914), Adobe Garamond (1989) and Adobe Caslon (1990) alongside the Monotype classics overseen by Morison between 1923 and 1937 (9). The period from 1890 to 1914 is ignored, even though his text devotes considerable space to the work of William Morris, name-checks the Ashendene Press and ATF (responsible for revivals of Bodoni and Jenson during these years) and discusses Plantin in depth. Moreover, the stretch between 1937 and 1989 is very fallow. Kelly only cites three faces from it, and one of them disparagingly: ITC Garamond (1975), ITC Galliard (1978) and ITC Baskerville (1982) (10). Most importantly, he barely acknowledges the new “golden age” of revivals that has blossomed in the past two decades, mentioning only Big Caslon, ITC Bodoni, ITC Founders Caslon, Mrs. Eaves, Corundum, Requiem (which, as he acknowledges, is a revival of calligraphy not an older typeface) and his own Epigrammata (11). What does he leave out? HTF Didot (1990), Linotype Didot (1991), DTL Fleischmann (1992), DTL Elzevir (1993), Foundry Wilson (1993), ITC Legacy Serif (1994), DTL VandenKeere (1994), Big Figgins (1995), Adobe Jenson (1995), Filosofia (1996), Miller (1997), Eudald (1998), Renard (1998), Custodia (2001), MvB Verdigris (2003), Merlo (2004), Rongel (2004), Adobe Garamond Premier Pro (2006), Arno (2007), Lyon (2009), and Kis Antiqua Now (2010) to name just a few (12). The third question in Kelly’s subtitle, “Where are they [revivals] going?“ is a momentous one that goes unanswered. As the list above attests there are an enormous number of new type revivals of high quality that have been issued in the recent past. What challenges have those designers faced and how have they solved them? How do these revivals compare to those of the first wave of type revivals (e.g. Custodia and DTL Elzevir vs. Van Dijck from Monotype)? These are some of the questions that Kelly should have tried to answer. Finally, there are those who are less enamored of revivals than he or I are. Some, like the late Will Powers argue that the digital versions of the Monotype revivals undertaken by Morison are weak compared to their metal models and that they should be tossed in the dustbin in favor of new designs made explicitly for digital production (13); and there are still many other designers who believe that all revivals are simply exercises in nostalgia and that we need typefaces that are “of our time” (however that may be defined) instead. What is Kelly’s response to these critics? Where are type revivals going? Type Revivals is a slim octavo booklet of sixteen pages (plus wrapper) designed and typeset (in Adobe Garamond Premier Pro) by Kelly himself. The typography is handsome but the format is not. All of the illustrations have been squeezed into the narrow outer margins. They are extremely small and thus virtually useless as aids to following Kelly’s arguments. Furthermore, they are often inadequately labeled (e.g. “18th century” instead of “Baskerville”; or, even better, “Baskerville, 1757”) (14). The topic of type revivals is endlessly fascinating, full of difficult and debatable definitions and issues. Kelly’s essay provides an predictable introduction to the subject, one that is marred by a large number of mistakes for such a short text. It is far from the last word. 1. The Typophiles, an informal New York-based group dedicated to the appreciation of books, printing, typography and calligraphy, was founded in the early 1930s by Paul A. Bennett, the longtime publicity manager for Mergenthaler Linotype. Its membership has consisted of book designers and production managers, paper salesmen, typesetters and typographers, calligraphers and librarians. 2. A better example than the Vergil type of Manni is the Augustaux c.1845), cut by Franscisque Rey fils at the instigation of the French printer Louis Perrin, that imitated Romany inscriptions near Lyon. 4. Americans have referred to the types of William Caslon “old style” since the 1850s [see Mosley’s Typefoundry blog] while the British have referred to them as “old face”, reserving the term “old style” for types cut in imitation of Caslon. Quadrat (pseud. Henry Lewis Bullen) sidestepped the potential confusion involved in these conflicting definitions by calling the faces of Phemister “modernized old style”. See The Inland Printer vol. 37, no. 6 (September 1906) p. 822. 5. One of the incunabular types was Renner (Bruce Type Foundry, 1898 and recut 1899), conceived of and supervised by Theodore Low De Vinne. It was not a “facsimile type”. De Vinne described it instead as “a fair copy but not a servile imitation” of the type used by Franz Renner in his Quadragesimale (1472). For more on Renner see No Art without Craft: The Life of Theodore Low De Vinne, Printer by Irene Tichenor (Boston: David R. Godine, Publisher, 2005, pp. 122–124. 6. Whether Basle Roman, Renner or the Caxton facsimile type is ugly is a matter of opinion. Unfortunately Kelly does not illustrate any of them in his monograph. “Morris had the freedom to use whatever font pleased him, without a publisher’s concern for sales among the general public,” Kelly comments in noting that Morris used both Basle Roman and the Caxton face for some of his own texts published before the creation of the Golden Type. 7. Kelly does not provide dates for any of these designs, saying only of Adobe Garamond that it was designed in the 1980s (p. 13), which is true but misleading for a font issued in 1989. As for ITC Garamond he ignores the fact that, being based on ATF Garamond, it is a revival of a revival—and is really a “Jannon” revival at that. Sabon is included in a list of “true” Garamonds but Sabon Next is not, even though its designer Jean-Francois Porchez claims to have created a type closer to Garamond than its forebear. 8. See “Adobe Garamond: A Review” by Mark Argetsinger and “Adobe Garamond: A New Adaptation of a Sixteenth-Century Type” by Jerry Kelly in Printing History vol. 13, no. 2 and vol. 14, no. 1 (1991–1992). 9. Morison joined the Monotype Corporation as its typographical advisor in 1923 so he cannot be credited with Monotype Garamond, issued in 1922, though he was one of several voices counseling the company. See Stanley Morison: His typographic achievement by James Moran (London: Lund Humphries, 1971), pp. 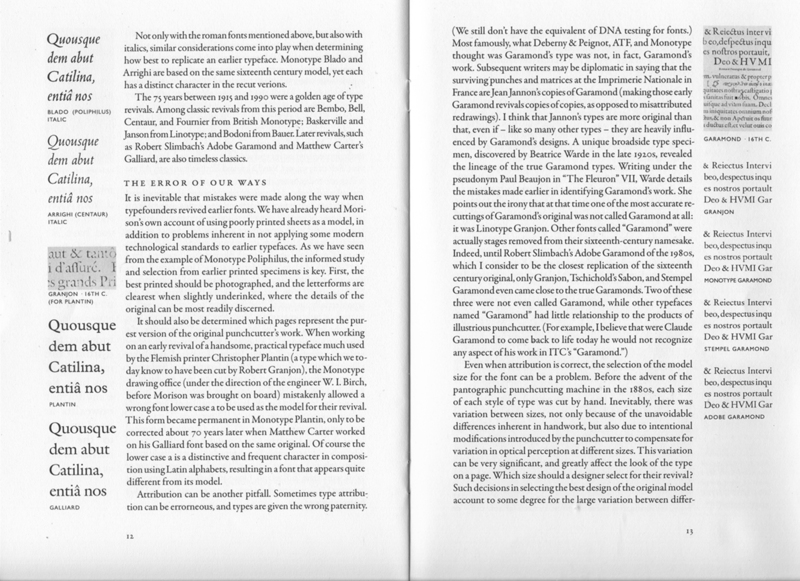 67–76 for a detailed account of both Morison’s appointment to Monotype and the development of Monotype Garamond. For the date of 1932 see the dissection notes below. 10. The few revivals of note from the period 1937–1989 include Monticello (1946), Eldorado (1953), Dante (1957), Sabon (1964–1967) (which Kelly mentions but does not discuss), ITC Galliard (1978), and ITC Baskerville (1982). However, many of the early typefaces from the International Typeface Corporation could be conisidered revivals, though surely not by Kelly: ITC Cheltenham, ITC Clearface, ITC Century, ITC Souvenir, ITC Garamond and ITC American Typewriter are derived from typefaces originally issued by American Type Founders; and ITC Bookman, ITC Tiffany, and ITC Korinna are modeled on 19th c. American designs. Kelly is fixated on Monotype, though he does belatedly acknowledge othe foundries: “Of course, typefounders like ATF, Deberny & Peignot, Bauer, and ohers also deserve credit for blazing this new ground [of revivals].” This list leaves out Stempel and English Linotype. 11. Epigrammata is based on a titling typeface ostensibly cut by Peter Schoeffer the Younger in the early 16th century. Kelly’s design deviates from its model (e.g. curl of bowl of P, tail of Q, spine of S, width of V) but Kelly does not engage in any discussion of the font. 12. 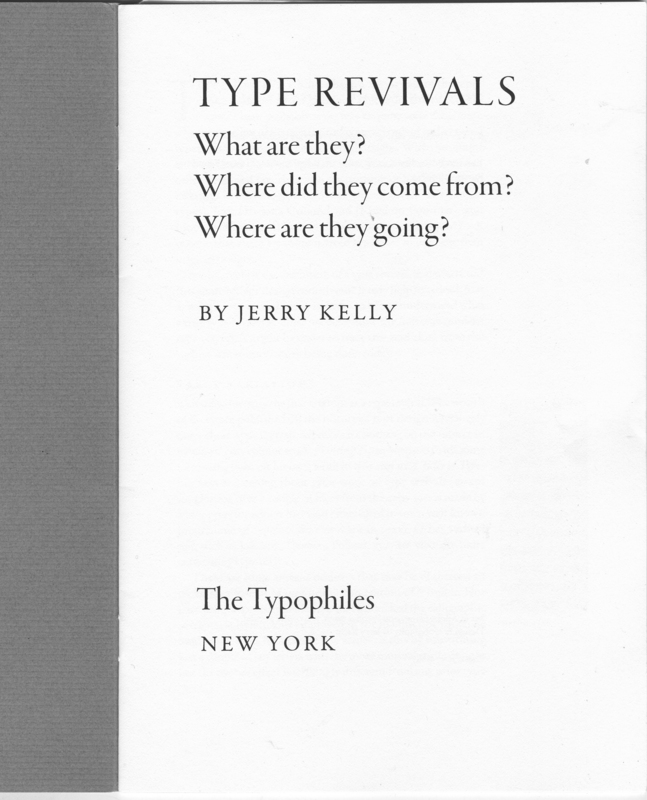 Kelly’s account of type revivals is highly skewed. He sidesteps revivals of typefaces from the 19th and 20th centuries as well as revivals of jobbing faces (e.g. Craw Clarendon (1955), AG Old Face (1984), and DTL Nobel (1993)). 13. See New Types for New Books by Will Powers (2006). It seems clear that Kelly does not share Powers’ concern about the quality of the digital versions of the classic Monotype revivals since he uses them as stand-ins for the metal originals in the illustrations to Type Revivals. 14. See p. 4 Caslon; p. 9 Griffo; p. 12 Granjon; p. 13 Garamond; and p. 14 Caslon. For the labeling see the dissection notes below. p. 11 Kelly spends half of the page discussing Stanley Morison’s role in the development of Perpetua, Lutetia, Emerson and Times Roman, none of which are revivals. This seems profligate in a short essay on revivals, especially when the ATF “program” of revivals (Bodoni, Cloister, Garamond, Baskerville, Bulmer) is only alluded to in passing.